The use of Nitrogen Gas offers a variety of benefits for industrial businesses. In the automotive manufacturing industry, Nitrogen Gas is needed to maintain a safe, clean, dry and inert environment for successful production of automotive electronics systems. Additionally, N2 use in the manufacturing atmosphere can have significant benefits on non-electronic applications. Due to the high temperatures that are required for soldering electronics during assembly, the presence of oxygen must be eliminated to avoid oxidation. Automotive electronics components such as welded parts, heat treating elements, safety systems and plastic extrusion, must all be produced in an environment that is controlled. By using N2 gas, specifically through the use of a Nitrogen Generator, automotive electronics systems can be manufactured in a safe, clean, dry and inert environment. See also: Nitrogen Gas with Automotive Electronics Manufacturing. In many manufacturing plants, N2 gas cylinders are used to store and apply Nitrogen. The problem with this method is the constant worry that the gas will run out during peak production times, or the hassle of having to change out the high-pressure tanks, which can become quite costly over time. An affordable solution to these issues is to invest in a Nitrogen Generator to be installed at your facility. Nitrogen Generators work by drawing N2 gas from the surrounding air and separating the oxygen molecules. 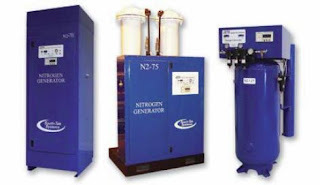 South-Tek Systems is pleased to offer a wide selection of Nitrogen Generators, available for a variety of industrial and manufacturing applications. South-Tek Systems' N2 GEN Series technology is safe, efficient, reliable and cost-effective. A one-time installation will bring you a lifetime supply of high purity Nitrogen. To learn more about South-Tek Systems and how your company can benefit from the use of an Nitrogen Generator for automotive applications, call 888-526-6284.